For the past year, joined by a number of experts from Idea Management area, we collaborated with the Journal of Social Media for Organizations (JSMO) to bring an interesting package of articles that would report on the recent Idea Management research and interesting case studies of ongoing projects. Today, as a result of this collaboration, we are happy to announce the release of a new Journal Special Issue entitled Large-Scale Ideation and Deliberation: Tools and Studies in Organizations. Otherwise, if you are just anxious to read the contents straight-away: all articles are available in PDF form online and for free at the JSMO website. Take note that the idea behind this special issue was to connect with authors working on their promising new research and ongoing applied projects. We wanted to provide support together with feedback for those authors who want to share with the public the preliminary results of their work and engage in a discussion on improvement of their research so far. Therefore, if you are particularly interested in some study details, have any comments or perhaps would like discuss collaboration – we encourage you to contact the authors directly through contact emails available per each article. The special issue is an outcome of joint effort of article authors, special issue editors and journal editors (especially Laurie Damianos and Jill Drury). We would like to thank all of them for the work put. 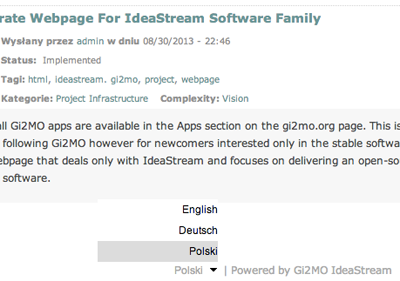 Gi2MO IdeaStream for Drupal 7.x released! We are happy to announce another milestone in Gi2MO IdeaStream development. Starting from now on, we give our user base the choice to pick which version of Drupal they prefer to use. Gi2MO IdeaStream supports both 6.x and 7.x with the same core set of Idea Management System functionalities. Drupal is a popular Content Management System (CMS) which is used by Gi2MO IdeaStream as a base platform. Initially, years ago when we kicked-off our project, IdeaStream was developed for the most popular version of Drupal system at the time – version 6.x. However, since then both IdeaStream and the Drupal platforms have evolved. In 2011 Drupal had its first 7.x release. The new version update has brought many changes, not only for the users but also in the overall system architecture. This had a profound impact on a lot of open-source modules and the community of developers that contributed earlier to Drupal 6.x. To this day many of the Drupal 6.x modules have their 7.x versions not yet fully developed, missing a lot of key features or simply in their alpha/beta state with a number of bugs. For this reason, Gi2MO IdeaStream has been a bit stale as far as Drupal 7.x adoption goes. However, today we would like to go ahead and deliver a version dedicated for Drupal 7.x for those who already require to use the new Drupal version. For us this meant a full rewrite of the entire Gi2MO IdeaStream, some community modules had to be removed, while others replaced with different ones. However, today we are happy to deliver a fully functional IdeaStream version for Drupal 7.x with a complete set of features available before for 6.x users. If you would like to try the new version, please go to our Apps section for IdeaStream. Since this is the first release for Drupal 7.x, we would be very happy to get any feedback about potential problems or feature requests. On the other hand, if you are not sure about this update and would like to know more about Drupal 7.x please read below our recommendations. Should You upgrade/migrate to Drupal 7.x? For those who are fully aware of Drupal 7.x capabilities and limitations, yet still require to use that version: Gi2MO IdeaStream v7.x-1.8 delivers them all what the 6.x does. For all the other users: we advise not to upgrade yet and wait for Drupal 7.x independent module community to become as rich as currently 6.x. The reason for above recommendation is a lot worse state of the community modules for version 7.x. A lot of them (including the ones used by IdeaStream) are heavily under-development, constantly changing and often do not have all features of their old but stable 6.x versions. Therefore, unless you need some specific functionality only available under Drupal 7.x, you will be heavily limited in terms of extendability of your system. What is new about Drupal 7.x? In our opinion, from the point of view of Idea Management System, the Drupal 7.x update does not bring huge novelties. The core set of functionalities remains the same. Still there are some changes in visual interaction and in terms of minor additional functionalities. For a detailed list see the Drupal homepage. We anticipate Drupal 7.x to continue evolving and being updated more than 6.x version in the coming future. It is possible that some of the very new community modules will have their versions only available for Drupal 7.x. We would like IdeaStream to be a good choice for now but also for the future. Therefore, we decided to provide a version for both 6.x and 7.x. Today we are happy to bring you yet another update for our flagship open-source Idea Management System – Gi2MO IdeaStream! This time the core focus went to improvement for the visual side of IdeaStream and adding some features that make accessing IdeaStream functionality easier. All new updates are present in both our themes: IdeaStream classic and IdeaStream Rainbow. Ability to add custom taxonomies to the filter bar – the updated theme allows users to filter ideas using any sort of taxonomy defined by the administrator, not only with the IdeaStream predefined Idea Categories taxonomy or Idea Statuses. An example of custom taxonomy filtering with a admin defined taxonomy called ‘Complexity’ (right click and open in new tab/window to view hi-res image). The configuration settings to setup custom taxonomy can be found in a newly added “IdeaStream Settings” located under “Administer\Site Configuration”. Please keep in mind that only taxonomies assigned to Idea content type can be used as filters. In order to add a new taxonomies go to “Administer\Content Management\Taxonomy”. Apart of setting the taxonomy to use as filter the administrator can use the privileges system to set which users should be able to use the new filter and which not. In order to accommodate taxonomies of any amount of terms, both the Idea Status and custom taxonomy filters now have drop-down menus that list all terms which did not fit into the filter bar. Another new feature is full internationalisation support. Starting version v1.8 IdeaStream supports Drupal standardised approach to multi-lingual user interface. Both IdeaStream modules and all themes comply with internationalisation API and allow to provide a translated version of the Idea Management Platform in multiple languages. Multi-lingual support in IdeaStream – a drop-down box can be used to select interface language. (right click and open in new tab/window to view hi-res image). The tutorial how to setup a multi-lingual up and running in included in the release package, in the install.txt. The file also includes a full list of all fixes and smaller additions in version v1.8. You can grab the newest installation package from the Gi2MO apps page for IdeaStream. We hope you enjoy the new release and await any sort of feedback or requests for future additions! Following the past updates for our open-source Idea Management System IdeaStream, today we have some new features for the data analytics module that delivers insights into statistics and various analyses about ideas – IdeaStream Analytics. The big new addition is called Cluster Analysis and allows to automatically group ideas based on similarities in term patterns and contextual information. For example: analysis of tags, how frequently are they assigned to ideas, if there are any typical groups of tags used together and how are they different from each other. The key part is the contextual analysis that not only leads to grouping ideas with similar terms but also allows to highlight how particular group is different from the remaining ideas in other groups. The Cluster Analysis starts to shine in systems of hundreds or even thousands of ideas, where it is difficult to understand the theme of gathered ideas and community preferences. 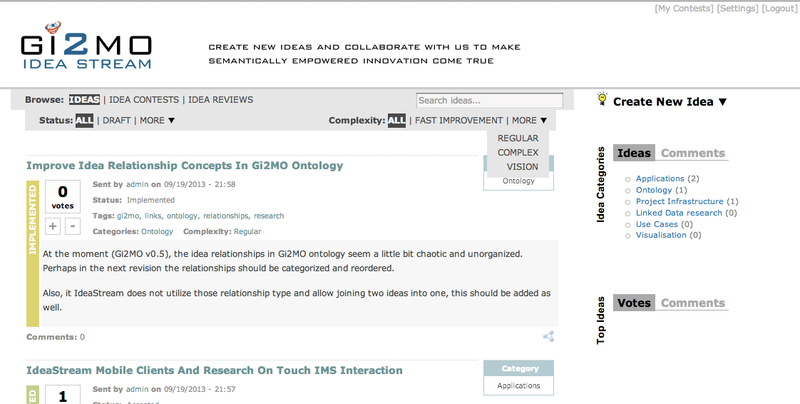 Currently, we implemented 5 different types of analyses: tag, category, frequent keywords (taken from the Drupal full-text search index), Gi2MO Types characteristics (fixed vocabulary describing innovation types) and Gi2MO Links relationships (supplied by the IdeaStream Similarity module). 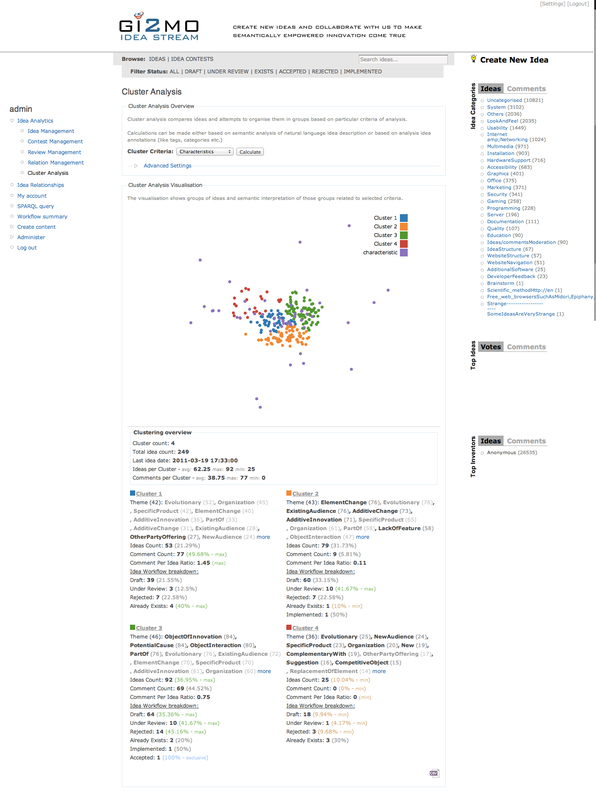 Cluster Analysis of Gi2MO Types annotations run for Ubuntu BrainStorm dataset (right click and open in new tab/window to view hi-res image). To understand how it all works – let’s see a simple example of an mockup system with ideas for a supermarket. 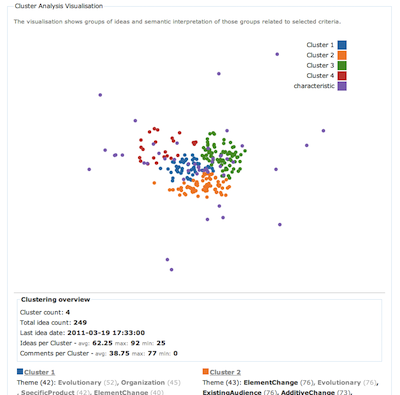 The picture below shows three groups detected based on cluster analysis of the dataset. The first group appears to be generic fruit ideas, the second group are ideas about fruits of a particular kind (peaches), while the third are ideas about vegetables being onions specifically. 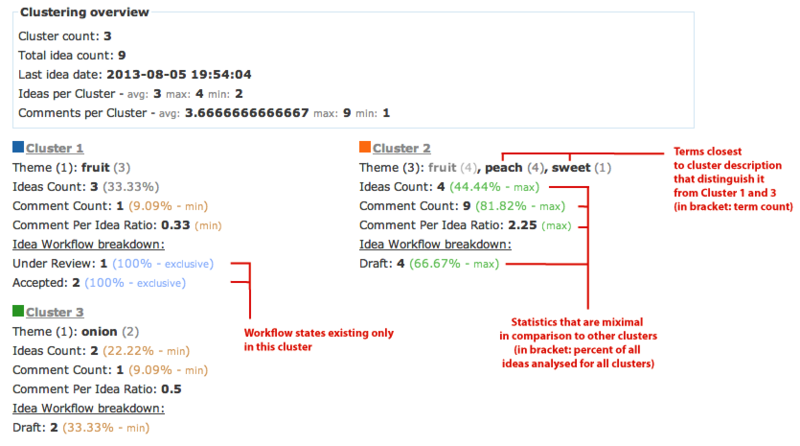 This already gives a nice overview of the entire system but further insights show that although generic fruit ideas are favoured by the reviewers and get accepted more often (workflow analysis), the detailed ideas about peaches win the community by a significant degree (top amount of comment and comment per idea ratio). Explanation of metrics and an example of Cluster Analysis based on Tags. To aid such rapid analysis of clusters IdeaStream Analytics delivers some calculations and highlights about all clusters. Firstly, we output the theme for each cluster: a full list terms used in those ideas ordered according to use frequency but also highlighted in bold if the term was detected as distinctive for the group in comparison to other groups. Furthermore, each group is described by idea count, comment count etc. supplied with indicators if the group has the top or minimal value in comparison to other clusters. Under the hood all of this is implemented using Singular Value Decomposition (SVD) used in a similar way as in an algorithm called Latent Semantic Analysis (LSA). In short, SVD allows to replace idea term annotations with new concepts that represent combinations of old terms, thus simplifying the analysis of idea similarity. Furthermore, SVD output allows to project terms and ideas into the same multi-dimensional space – in practice this allows us to draw a scatter plot to observe semantic distances between ideas and terms visually. Furthermore, on top of SVD, IdeaStream Analytics uses an unsupervised clustering algorithm called k-Means to automatically group the similar ideas together. Also, to make this meaningful for Idea Management, we add a number of custom calculations to deliver some interesting insights and analytics about the discovered idea groups. The drawback of the entire solution is that it’s quite hungry for memory and computational power. As a result, the current implementation allows a number of settings to limit the amount of terms analysed and blacklist some unwanted terms (specially useful for keyword analysis that often will have many unwanted words). To check all this in action go to the apps section for IdeaStream Analytics, download the version and find out yourself! Since this is a first release of this feature we welcome any feedback and information about its use in practice (e.g. which statistics are missing, how to better describe cluster theme or any sort of complaints). Rather than introducing new publications ourselves, this time Gi2MO is joining the effort to stimulate Idea Management research in general! We are happy to announce a Call for Papers for the Workshop on Large-Scale Idea Management & Deliberation Systems (LSID 2013). Aside of publishing new achievements in the area, the primary aim of the workshop is to be a networking event to start new collaborations. Therefore, aside of typical paper presentations expect organised networking sessions and discussions. Following the successful formula of the previous workshop editions, all the organisers are going to attend the event, so expect this to be a good opportunity to meet a passionate group of people who work and influence research on large-scale deliberation systems and communities. The workshop aims to assemble a diverse set of participants with an interest in studying or building systems for large-scale ideation and deliberation in business or civic settings. Aside of presenting new work in the area, the goal of the workshop is to enable a multi-disciplinary discussion about the key research questions and related themes underlying the design, deployment, and evaluation of LSID platforms in real world contexts. Therefore, in addition to presentations, the workshop will involve networking activities of all workshop participants in a series of organised discussions on the future developments of deliberation systems and managing collaboration for future joint projects. How can we facilitate interaction of large communities ? How can we organise information stored in deliberation systems and enable to utilise this data in an efficient way? How can we maintain sustainability of deliberation platforms and stimulate impact of discussions and ideas? The LSID Workshop invites researchers, engineers, software developers to present their research and works in the field of idea management and deliberation systems. Papers may deal with methods, models, case studies, practical experiences and technologies. Josh Folk, IdeaScale, Washington, D.C.
Our open source Idea Management System – Gi2MO IdeaStream is built on top of a platform called Drupal. Drupal is a Content Management System (CMS) that delivers huge flexibility in terms of looks (themes) and functionality (modules). Having deployed IdeaStream in a number of organisations, we would like to highlight how easily and to what degree IdeaStream can be customised to fit into variety of use cases. For this goal we will use a few examples. 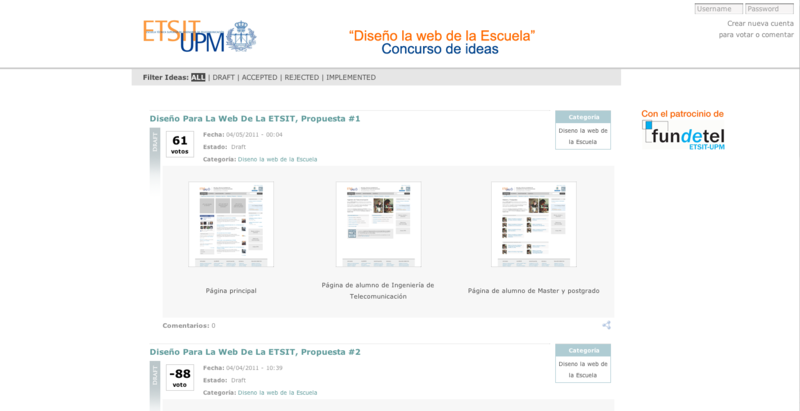 First up is a very basic scenario: IdeaStream was used at the ETSIT Telecommunication school of the Universidad Politecnica de Madrid to organize a contest for choosing a new design of the school website. The goal for us here was to quickly deploy the system to let students vote as soon as possible, yet to allow them to see the proposed designs at the frontpage immediately when it loads. 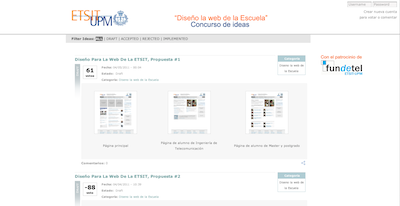 Front page of the ETSIT IdeasWeb competition. Next example comes from INRIA institute. 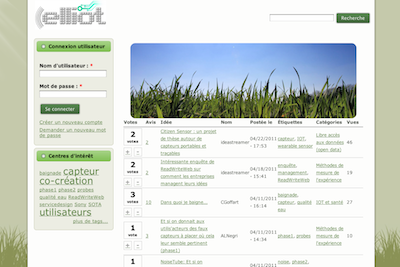 The INRIA researchers used IdeaStream as part of their experiments with civic innovation in an EU funded project called Elliot. In one of their case studies on green technologies, IdeaStream looks was completely overhauled to fit project theme. In comparison to the original theme Elliot version new looks is more squeezed allowing to see more ideas in one go. 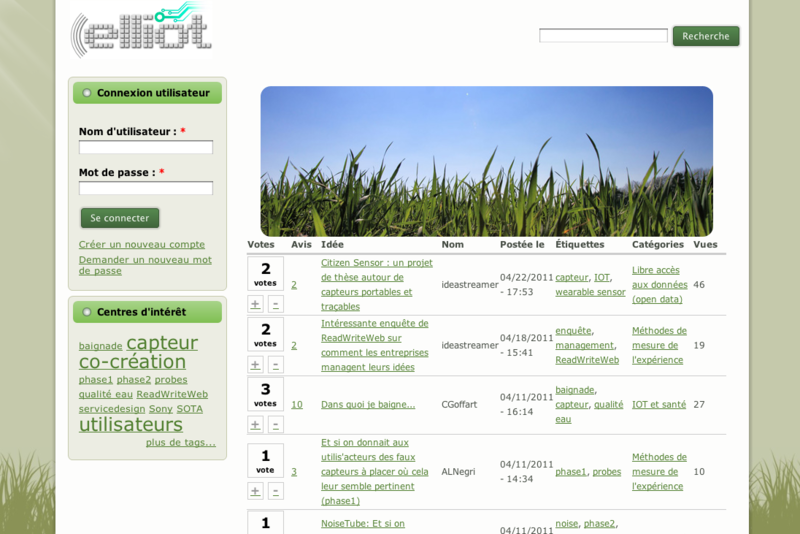 Modified IdeaStream to fit the green theme of Elliot project. Finally, in our own experiments, we tested how far theming could be pushed. For this goal, we created a more colourful theme that contrasts with the clean enterprise look of the original IdeaStream theme. The goal here was to go toward candy looks of Web 2.0 websites but still to maintain some of the seriousness of Idea Management platforms. 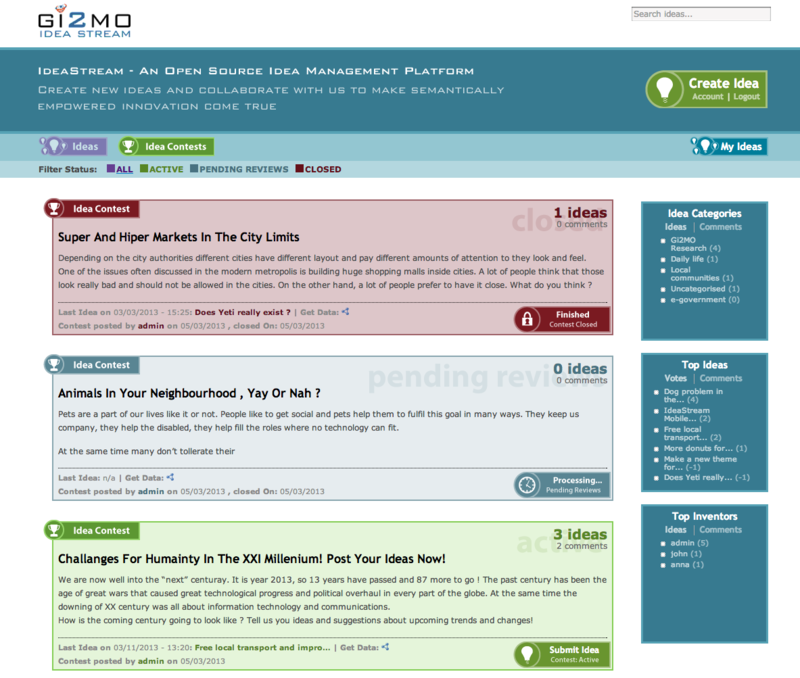 Idea Contests page of an alternative theme for IdeaStream that presents a more vivid and colourful face of the IMS. If you would like to see for yourself how this theme works in action, you can do just that by downloading the newest version of Gi2MO IdeaStream! Today, we are happy to release IdeaStream v1.7 that includes the new theme called IdeaStream Rainbow and some minor bug fixes. Additionally, having tested IdeaStream with a number of organisations over the past years, we are happy to finally move out from alpha and release it as a stable build! As usual for download links see the Gi2MO apps section. If you would like to customise IdeaStream to fit your own use case let us know, we will be happy to help! Optionally, if you already done it and would like to share you own experiments with open-source community of IdeaStream – give us a shout and we will be happy to highlight it here. Some time ago we introduced a new module for IdeaStream called Similarity. The module delivered a number of features that enabled users as well as moderators to mark relationships between ideas automatically detected as similar. 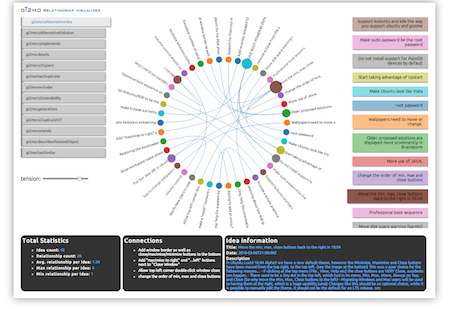 Today, we would like to share a research prototype that visualises this relationship data and provides some basic statistics on how ideas are connected to each other. The Gi2MO Relationship Visualizer allows to filter relationship views by type and filter out connections for a single idea. Additionally, the demonstrator allows to have a peak at some of the relationship statistics such as: number of ideas connected with relationships, number of relationships, max/min/average amount of relationships per idea. Gi2MO Relationship Visualizer showing ‘Alternative Idea’ relationships detected in Ubuntu BrainStorm. The Gi2MO Relationship Visualizer can work with any system as long as it allows to export IMS data into RDF/XML following our Gi2MO Ontology guidelines. For instance, in IdeaStream Idea Management platform, this can be achieved with our RDFme module. As usual, the complete source code and overview of the software can be found in related Gi2MO Apps subsection. Optionally, you can have a quick peak at a screencast below, recorded to demo the main features of the Visualizer. Gi2MO Types taxonomy – a set of terms for domain independent categorisation of ideas. 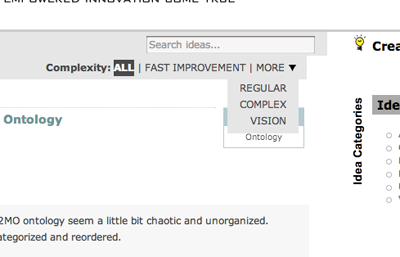 The taxonomy consists of over 70 terms organised in 4 branches: idea trigger, innovation, proposal type and object. Gi2MO Types metrics – a model for transforming taxonomy annotations into metrics that measure the performance and characteristics of your Idea Management System. 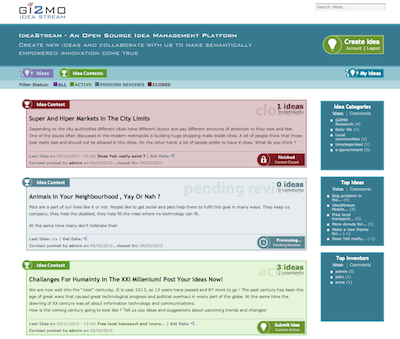 Integration with IdeaStream – both proposals have been integrated into our open-source Idea Management System: IdeaStream. The base module supports display of annotations and taxonomy import, while IdeaStream Analytics allows to calculate the metrics. Today, we would like to reveal another peace of the puzzle – results of experiments on the usage of our Gi2MO Types taxonomy. Our article entitled “Classifying and Comparing Community Innovation in Idea Management Systems” has just been accepted for publication in the Decision Support Systems journal so we are proud to bring you the preprint version (the final version will be made available by the publisher soon). experiments (A): automatic annotation (machine learning) and manual annotation experiments with the taxonomy. If any of the above are within your interests please find the preprint version of the article in Gi2MO Docs section. The electronic version of the corrected proof currently in press is also available from the publisher on science direct website.